M Sukeik, P Sharda, S Maheswaran. 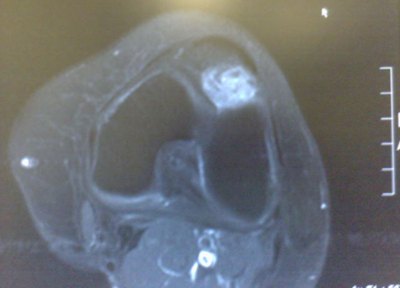 Giant cell tumor of the tendon sheath in a knee. The Internet Journal of Orthopedic Surgery. 2007 Volume 9 Number 2. Giant cell tumor of the tendon sheath is an idiopathic benign tumor of the synovial membrane which is rarely seen in large joints. 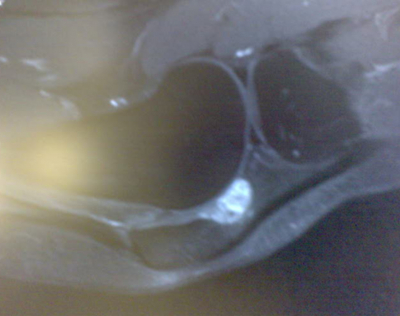 We report a case of a giant cell tumor of the tendon sheath in a knee which presented with persistent anterior knee pain and swelling after trivial injury to the knee with emphasis on the importance of considering such tumors in the differential diagnosis of patients presenting with knee pain and swelling. A 50-year-old woman normally fit and healthy presented to her general practitioner after a trivial injury to the left knee with persistent anterior knee pain. Physical examination revealed tenderness over the lateral aspect of the patella but with a full range of movement of the knee and a negative McMurray's test. X-rays were normal. She was treated with standard painkillers and quadriceps exercises. After 6 months of conservative management, the patient did not improve. An MRI scan was performed and showed a soft tissue mass, with a differential diagnosis of pigmented villonodular synovitis (PVNS) (fig1, 2). The patient was consequently referred to us for further evaluation and management. We performed an arthroscopy that revealed a bulging mass into the knee joint and a miniature arthrotomy was required to excise the mass completely. Morphologically it looked like a PVNS, but subsequent histology confirmed a giant cell tumor of the tendon sheath (GCTTS) (fig3). The post-operative period was uneventful and there was no evidence of local recurrence on follow up after one year. GCTTS is an idiopathic benign tumor of the synovial membrane and is one of the most common soft tissue tumors in the hand1, 2. However, it is seen rarely in large joints3. It usually affects adults with a peak incidence in the third to fifth decades of life and is more often seen in women than in men4,5,6. It usually presents with soft-tissue swelling and pain7, 8. GCTTS is a slowly proliferative tumor that may infiltrate the overlying dermis and erode the bone by pressure or direct invasion9, 10, 11. Although rare, a malignant GCTTS can occur12. Most giant-cell tumors are treated with surgical excision. The reported recurrence rate varies from approximately 10–20%7, 13. In rare, aggressive lesions, local recurrence may necessitate resection and radiation therapy7. Our case report emphasizes the importance of considering GCTTS in the differential diagnosis of soft tissue swelling and pain in large joints. 3. Rosenberg A. Soft tissue tumors and tumor like lesions. In: Cotran RS, Kumar V, Collins T, eds. Robbins Pathologic Basis of Disease. 6th ed. Philadelphia, Pa: Saunders; 1999:1258-1259. 4. Ushijima M, Hashimoto H, Tsuneyoshi M, Enjoji M. Giant cell tumor of the tendon sheath (nodular tenosynovitis). Cancer 1986;57:875-84. 5. Oyemade GAA, Abioye AA. 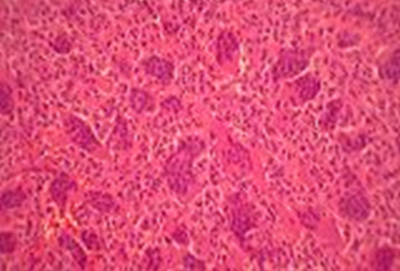 A clinicopathologic review of benign giant cell tumors of tendon sheaths in lbadan, Nigeria. Am J Surg 1977;134:392-5. 6. Karasick D, Karasick S. Giant cell tumor of tendon sheath: spectrum of radiologic findings. Skeletal Radiol 1992;21: 219-24.